Start your route in Tallahassee Florida and go south on Route 319 towards till you intersect Route 267. Take Route 267 east to Bethel and on to Newport. After Newport, get on Route 98 heading west towards the town of Tully. After Tully continue south on Route 98 till you see Route 319 off to the right. Take a right on Route 319 (west) and head all the way down to the Gulf coast where 319 will merge with 98. Take this route all the way to the route's end at Panama city. You can take a detour off of 98 on to 30 (heading West) if you want to visit St. Joseph Peninsula State Park. This route takes you from the hilly beginnings of the Appalachian Mountains (in Tallahassee) through dense forests and finally along miles and miles of prime Florida coastland. 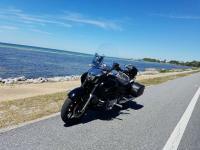 This Florida route rates second only to the Rte. 1 along the Florida Keys in terms of scenery. This seems to have much more character than any other Florida coastal drive I've been on. The route is not too commercial and there are a lot of interesting bridges you will get to cross. The areas by Tallahassee are interesting because they are somewhat hilly which is rare for most of Florida. Here is a breakdown of things to do on this route traveling from Tallahassee to Panama City: Tallahassee Florida - this city is the state capital for Florida since 1824 and maintains an old southern city charm that many visitors find appealing. Much of this charm is preserved in Tallahassee historical districts such as Adams street commons, Calhoun Street and Park Avenue. Learn about the history of Florida while visiting the recently restored Capital building that was originally constructed in 1845. Take a detour north of Tallahassee on Rte. 319 to visit the Maclay State Gardens. You'll be amazed by the different collection of magnolias, dogwoods, and azaleas. About 10 miles south of Tallahassee on Rte. 319 check out the Leon Sinks Geological Area to see five huge natural sinks. These holes are large as 200 feet and are truly striking to see first hand. Shortly after you get on Rte. 267 you can stop at the Edward Ball Wakulla Springs State Park and see where they filmed the early Tarzan movies. This park offers trails and riverboat tours from which you can see some of the Florida wildlife (alligators, snakes, birds). Glass-bottom boat tours are available and you can see one of the springs explorer Ponce de Leon discovered in his quest to find the fountain of youth. You will pass by the Apalachicola National Forest which has a ton of water sports to get involved in including fishing, boating, and swiming including some camping as well (watch out for the Alligators though!). The has five different lakes to enjoy: Silver Lake, Camel Lake, and Wright Lake (are "Recreation Areas") And Fort Gadsen and Leon Sinks are two special areas. On the south tip of Rte. 59 you will enter the St. Marks National wildlife refuge where you can see a barge of wildlife from the many observation areas. Also, a lighthouse built in the 1830s is located on the bay. Ochlockonee River State Park (off of Rte. 319) - more wildlife observing (gray fox, bobcats, deer, alligators, rare red-cockaded woodpeckers) Carrabelle - offers a ferry to Dog Island with a rustic eight-room inn. St. George Island State Park - cross a bridge (G1A) just west of Eastport off of Rte. 319/98 and you'll find great hiking and camping offered on this island. Off of Rte. 98 the town of Apalachicola has a state museum honoring Dr. John Gorrie. Here John Gorrie back in 1840 attempted to keep his patients with yellow fever cool by inventing the first mechanical icemaker. If any state would want to honor the man who's invention led to the creation of the air conditioner it would be Florida. St Joseph Peninsula State Park - this remote park offers a view of the natural undeveloped Florida panhandle while you drive along this barrier island. St. Andrews State Recreation Area - just south of Panama City, this area offers visitors world-class white sand beaches and steep sand dunes for exploration along this barrier peninsula. The town of Panama City is a great place to start out or end your trip. It is jam packed with things to do, places to eat, and places to sleep. Many people make Panama city the destination for their yearly vacation. You can avoid the crowds in the wintertime and save on lodging. Panama city is known for its party atmosphere and has access to world-class white sand beaches. Here is a breakdown of things to do on this route traveling from Tallahassee to Panama City: Tallahassee Florida - this city is the state capital for Florida since 1824 and maintains an old southern city charm that many visitors find appealing.Much of this charm is preserved in Tallahassee historical districts such as Adams street commons, Calhoun Street and Park Avenue.Learn about the history of Florida while visiting the recently restored Capital building that was originally constructed in 1845.Take a detour north of Tallahassee on Rte. 319 to visit the Maclay State Gardens.You'll be amazed by the different collection of magnolias, dogwoods, and azaleas. About 10 miles south of Tallahassee on Rte. 319 check out the Leon Sinks Geological Area to see five huge natural sinks.These holes are large as 200 feet and are truly striking to see first hand. Shortly after you get on Rte. 267 you can stop at the Edward Ball Wakulla Springs State Park and see where they filmed the early Tarzan movies.This park offers trails and riverboat tours from which you can see some of the Florida wildlife (alligators, snakes, birds).Glass-bottom boat tours are available and you can see one of the springs explorer Ponce de Leon discovered in his quest to find the fountain of youth. You will pass by the Apalachicola National Forest which has a ton of water sports to get involved in including fishing, boating, and swiming including some camping as well (watch out for the Alligators though!). The has five different lakes to enjoy: Silver Lake, Camel Lake, and Wright Lake (are "Recreation Areas") And Fort Gadsen and Leon Sinks are two special areas. On the south tip of Rte. 59 you will enter the St. Marks National wildlife refuge where you can see a barge of wildlife from the many observation areas.Also, a lighthouse built in the 1830s is located on the bay. Ochlockonee River State Park (off of Rte. 319) - more wildlife observing (gray fox, bobcats, deer, alligators, rare red-cockaded woodpeckers) Carrabelle - offers a ferry to Dog Island with a rustic eight-room inn. St. George Island State Park - cross a bridge (G1A) just west of Eastport off of Rte. 319/98 and you'll find great hiking and camping offered on this island. Off of Rte. 98 the town of Apalachicola has a state museum honoring Dr. John Gorrie.Here John Gorrie back in 1840 attempted to keep his patients with yellow fever cool by inventing the first mechanical icemaker.If any state would want to honor the man who's invention led to the creation of the air conditioner it would be Florida. St Joseph Peninsula State Park - this remote park offers a view of the natural undeveloped Florida panhandle while you drive along this barrier island. St. Andrews State Recreation Area - just south of Panama City, this area offers visitors world-class white sand beaches and steep sand dunes for exploration along this barrier peninsula. The town of Panama City is a great place to start out or end your trip.It is jam packed with things to do, places to eat, and places to sleep.Many people make Panama city the destination for their yearly vacation.You can avoid the crowds in the wintertime and save on lodging.Panama city is known for its party atmosphere and has access to world-class white sand beaches. on April 1, 2013 6 out of 6 members found this review useful. Great ride. Have ridden many variations of this route, for work and fun. But to truly take in the whole experience you need to stop and visit each location. Whether you start in Tallahassee or Panama City, if you add Hwy 231 North to 20 East, you create a circuit that can take an entire weekend. Took my girlfriend, we stopped at each place and took in everything: walked the parks, visited the shops in Appalach only made it half way. If you truly want to partake of what is there, make reservations to stay the night on St. George Island, and make a weekend of it. on February 12, 2015 3 out of 4 members found this review useful. This is a great route. A highlight is the stretch from Alligator Point to Apalachicola. I have ridden almost everywhere in FL and this is the best uninterrupted stretch of costal riding I have found in the state. on February 6, 2018 2 out of 2 members found this review useful. Great scenic route with pretty low levels of traffic and a good amount of slight curves. Just be careful speeding here as the cops love to sit in driveways on this route.